The Sacred Art Tarot is comprised of manipulated classical art masterpieces from the Middle Ages to the Pre-Raphaelites. Many of the images are spiritually oriented, though you don't need to be religious to work with this deck. As someone who knows virtually nothing about art history and little about organized religion, I was able to read with the deck very well. The images are beautiful and do indeed invoke a gentle spiritual vibe. Andre St. Dryden writes in the LWB, "The images were created from the works of many great artists. Although the images in this particular deck are predominately of Christian orientation, they are not limited to a single belief. So view them as spiritual doorways rather than dogmatic religious images." The first thing I noticed were the ornate gold frame borders. I usually don't care for borders, so I was surprised to find that I actually liked these. The frames give the feeling of being in an art museum. And I can just see myself walking through a museum reading the artwork. Shuffling the deck and laying out the cards becomes an instant rearranging of the paintings on the wall. I was also reminded of the paintings in the Harry Potter series, and how the painted characters would interact with each other, even moving from one painting to the next. The Aces in this deck each feature a person, rather than just the singular suit symbol, my favorite being the Ace of Swords (shown at right) which appears to be a disembodied head. Here's where the art history would have come in handy, or an accompanying book, because I have no idea who this painting depicts. The suit symbols (cups, wands, swords and coins) are all added to the paintings, some more obviously than others. While most of the images are well incorporated, there are a few that miss the mark. It's really just the Wands suit with the troublesome cards. 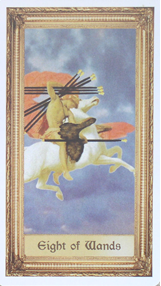 The Eight and Ten of Wands, in particular are the two which stand out the most. The stark black lines which serve as wands look like simple computer generated straight lines, and are unnaturally placed in the scenes so that they stand out like sore thumbs in otherwise beautiful and natural looking paintings. They are lined up parallel to each other in ways that they just wouldn't fall if someone were really holding onto them. They are too obviously foreign to blend in. Some images have been changed in other ways, but I wouldn't recognize the changes if I wasn't familiar with the original painting. 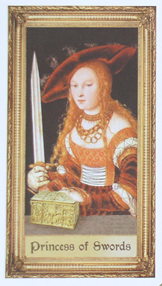 For example, the Princess of Swords (shown below) is "Judith with the Head of Holofernes" by Lucas Cranach the Elder. In the original painting, Judith is holding the head of Holofernes, whom she has beheaded. 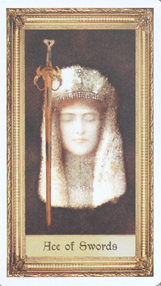 In the manipulated Princess of Swords card, we see her hand resting on a gold box instead. This transformation looks seamless, which makes me even more curious about the sloppiness of the Wands cards. 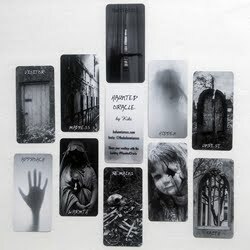 This is a deck which would greatly benefit from an accompanying book. There is no mention anywhere of the artists featured or who is depicted in the paintings. 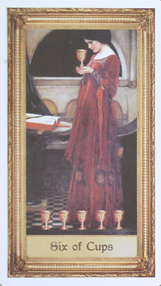 I recognized "The Crystal Ball" in the Six of Cups (shown above) only because I love John William Waterhouse. However, I found I was able to read the images intuitively without any knowledge of the paintings' origins or background stories. Though a book would have been a nice addition, it isn't necessary to successfully read with the deck. I find it easy to be swept away in the images of these cards, as they transport me out of modern day life, and back into the very different world of the past. 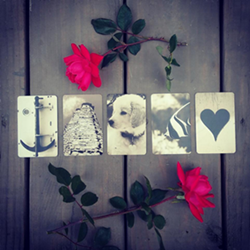 Emotions will always translate through the ages, so it is very easy to transfer the feelings you get by looking at these cards and apply them to the situation you are reading for today. There are so many beautiful cards, it is hard to choose a single favorite. From what I can see, it looks like the woman in the Ten of Cups (shown below) is breasteeding her toddler. I love this, and it is one of my favorite cards. Some of the others which top my list are the Six of Cups (above), the Star, Two of Cups and Nine of Coins (all shown below). My least favorite card would have to be either the Eight or Ten of Wands, due to the unnatural placement of the wands. I have found these cards to deliver readings with a very serious tone. Gentle yet firm. While there are other decks which are comfortable cracking jokes and poking fun, this is not one of them. It would be a good choice to consult for serious or spiritual matters or those close to your heart. The cards have a romantic feel to them, in a slightly somber and controlled, old world way. The readings I have done with the Sacred Art Tarot have been very accurate and easy to understand. The paintings work very well together, and allow for well integrated stories to emerge. 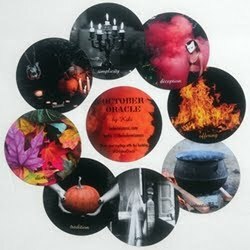 The cards have a beautiful and natural flow to them when spread out side by side. The Little White Book which accompanies the Sacred Art Tarot offers general meanings for the cards, and are not specific to this deck. Andre St. Dryden has included a brief commentary which mostly addresses tarot in general. There is also a foreward written by Jeannette K. Roth (President of The Tarot Garden). The LWB features two 10-card spreads, the Celtic Cross and the Qabalistic Cross. Two blank pages are provided for notes. 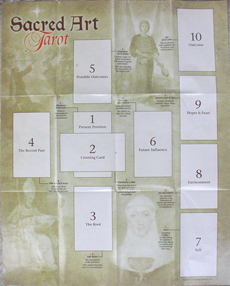 The Spread Sheet included with the Premier Edition (shown at left) is custom designed for the Sacred Art Tarot, and displays a layout which differs from both of the spreads included in the LWB. Spread sheet measures approximately 17" x 21" and folds up for easy storage. 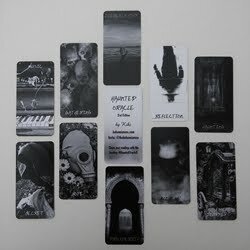 I would recommend this deck for anyone who appreciates the beauty of classical art. 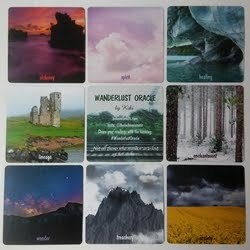 It's a gorgeous set of cards that lends a beautiful atmosphere to a reading. And for those who aren't well versed in religion or art history, don't let that be a hindrance. If you connect with the images, that's all you will need to be able to read successfully with this deck. Deck: Sacred Art Tarot, published by US Games Systems, Inc.
2016 UPDATE: This deck is now out of print, and no longer sold by US Games. This deck review was originally published on my previous blog (Tarot Dame) on 6/22/08.